The stone pictured here is a variety of sizes, colors, textures and shapes. 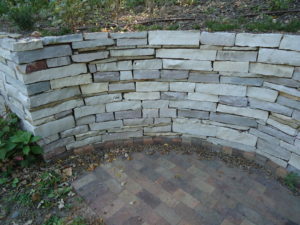 This is all natural stone, and natural stone retaining walls are one of a few things we specialize in. From the linear and rectangular blocks of principally one form of limestone or another, to the use of larger blocks of limestone in a “random ashlar” fashion. To my knowledge, we are the only local contractor who offer these types of retaining walls, the only contractor, again to my knowledge, who build this kind of wall. This wall should be built only where the scale demands the use of these larger blocks of stone. 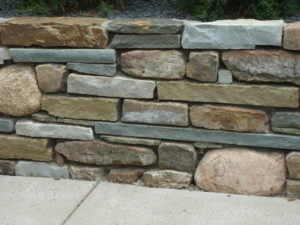 Another popular choice these days is using “fieldstone” to build boulder walls. I have built countless of these over the years, and have an approach to these that sets us apart from most contractors: I use the stone in random fashion, letting the individual boulders tell me where to place them in the wall. There will be no even coursing, no horizontal lines in these walls, a true random approach which accentuates the individual shapes of each boulder. No two of these walls will ever be the same. 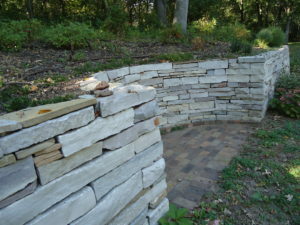 Lastly, Outdoor Concepts builds a variety of retaining walls using limestone rip-rap, using the boulder wall approach to make them truly random. These walls are more than just random, they are truly works of art with characteristics that set them apart from other walls. They are all one color, unlike fieldstone, and the sharper edges lock the stone together better than the rounded fieldstone. Sturdy and good looking, a good combination.